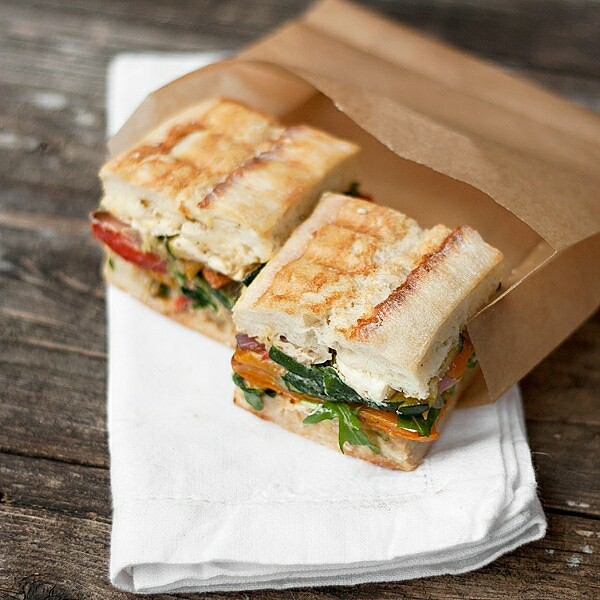 Delicious roasted vegetable pressed sandwich recipe, with goat cheese, balsamic and arugula. 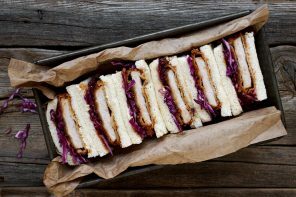 Back in the summer, I posted a Picnic Perfect Pressed Sandwich. 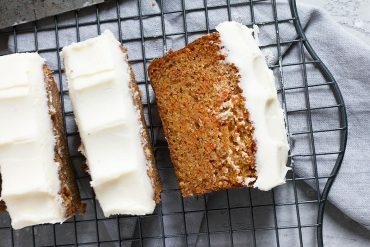 It’s perfect for summer lunches. But it’s Winter now, and a different type of pressed sandwich is in order. 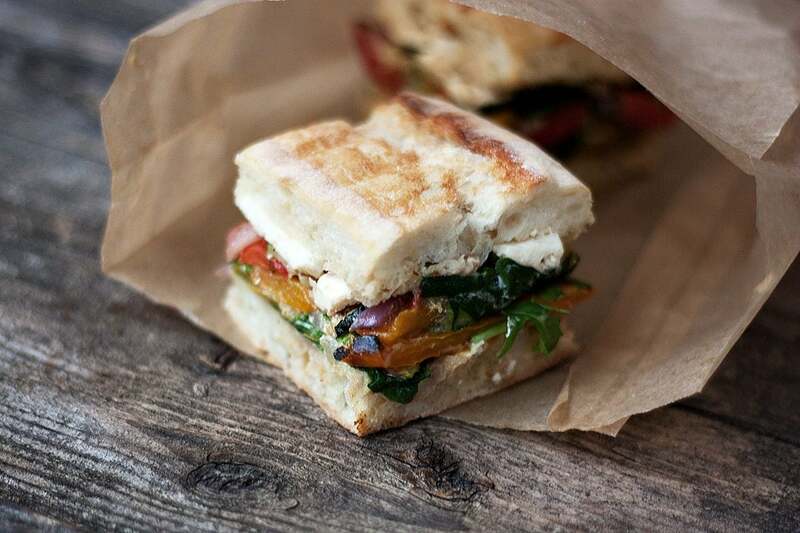 Here’s my favourite – roasted vegetables, with a balsamic drizzle, goat cheese and arugula, pressed on a ciabatta bun and lightly toasted in a panini press or sandwich grill. I like to make these in the morning. I’ll assemble and set to press in the fridge. Later in the day, I’ll trim and toast, re-wrap and store in the fridge for weekday lunches, or enjoy for dinner, with a bowl of soup. I don’t have a panini press. I just use my george-forman-ish grill thing and give it a little squeeze – just enough to warm the sandwich, melt the cheese and lightly toast the outside. If you don’t have either, just a few seconds in the microwave will warm up the filling and cheese. Be sure to get your vegetables as dry as possible before placing on sandwich, to prevent a soggy sandwich and filling "slippage". 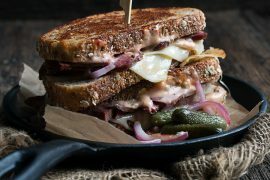 This is a great sandwich to enjoy for dinner, with a bowl of soup, or make ahead from a great weekend lunchbox sandwich. 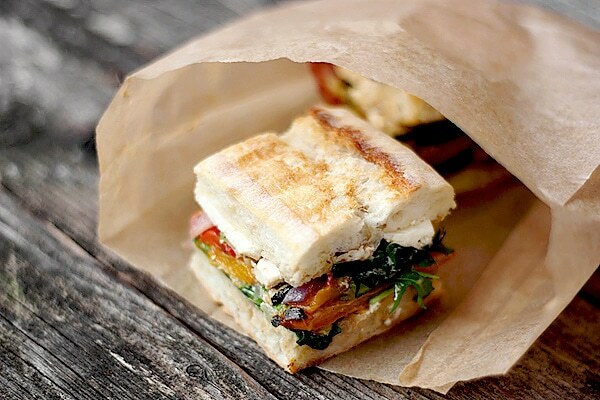 You can warm in a panini or grill press, or in the microwave. Roast your peppers: pre-heat the broiler on your oven. Slice the sides off the peppers and place, skin side up, on a baking sheet. 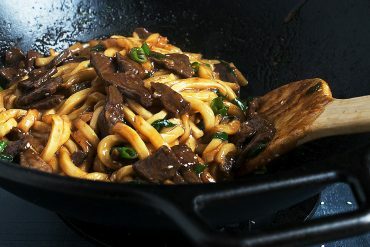 Place under the broiler until the skin is bubbly and quite browned (10-15 minutes). Remove from the oven and place the peppers into a plastic or paper bag, seal and place in the fridge for 20-30 minutes. Leave the broiler on. Meanwhile, slice your onions and zucchini. On a baking sheet, arrange the zucchini slices in a single layer and sprinkle the onion pieces over top. Sprinkle with a bit of salt and freshly ground pepper. Place under the broiler until the zucchini has dried and shriveled, but not browned too much (about 8-12 minutes). Remove from the oven and leave on the baking sheet to cool a bit. (Hopefully, the zucchini are fairly dry. If not remove to a paper towel to cool. While the zucchini is cooling, take the peppers from the fridge and using the sharp edge of a knife, peel off the charred skin and discard. Place the peppers onto a paper towel, do dry the surface off a bit. 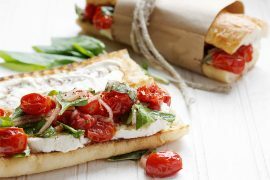 Prepare your sandwiches: If using a ciabata baguette, cut it into 2 or 3 pieces, then cut your ciabatta loaf pieces or buns in half from the side and butter both sides. On the bottom half, place a generous layer of arugula. Top with a single layer of roasted pepper, then a layer of the zucchini slices and a few onion pieces. Drizzle with some balsamic vinegar. Top with crumbled goat cheese, then place the top of the bun on top. 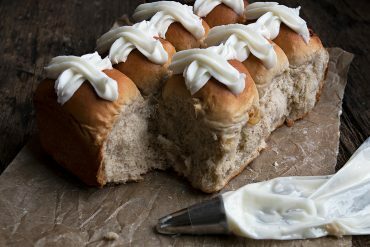 Wrap tightly with plastic wrap (wrap a couple of times to prevent bread from drying out). Place on the shelf in your refrigerator and place a flat plate or other flat object on top. Top the plate with something heavy (cans of tomatoes work well). 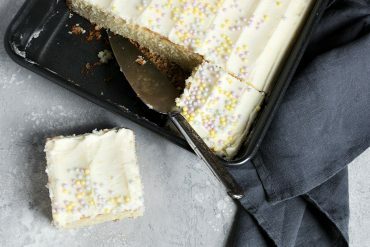 Allow to press in the fridge for 4-6 hours or overnight. 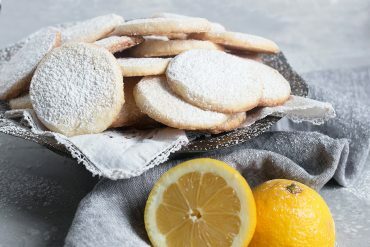 Once pressed, remove from fridge, unwrap and trim edges, if desired (not necessary, just look a little prettier). If you like, pop into a panini press or grill press to warm and toast lightly, or microwave for 30 seconds or so to warm. No one makes sandwiches look as pretty as you do! These are just gorgeous. They sound so good, too! 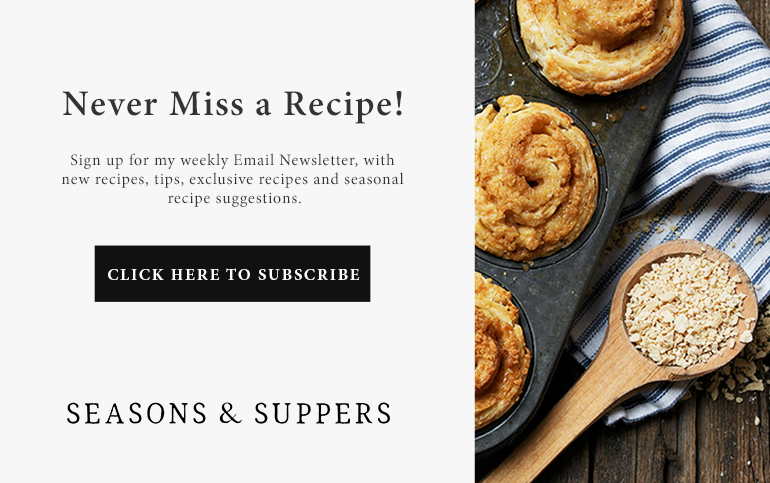 –This weekend I need easy finger-food dinner ideas (we’re hosting an evening of drinks and board games) — I think these might just be perfect! Thanks! Thanks Sophie. Yes, the would be perfect for your evening (which sounds like great fun). 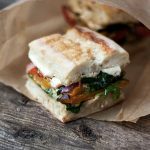 The combination of goat cheese and roasted vegetables on a ciabatta sounds so delicious! This is a sandwich I would really enjoy with its veggies, goat cheese and great bread. It is my favourite. I love it slightly warm – just enough to melt the goat cheese a bit. Sandwich heaven!